Commonly also referred to as "Tip-On Style Jackets," this type of ultra deluxe jacket dates back to the early days of vinyl's mainstream popularity. This was the deluxe way to package a record in the 50's and 60's and it's hard to find a record collection that doesn't have one amidst it. These are much much thicker than a normal jacket, and similar to the construction of a nice boxset or hard bound book, they are made from thick carton "corpses" which are wrapped with what amounts to a giant very high quality sticker, which then holds the structure of the jacket together. 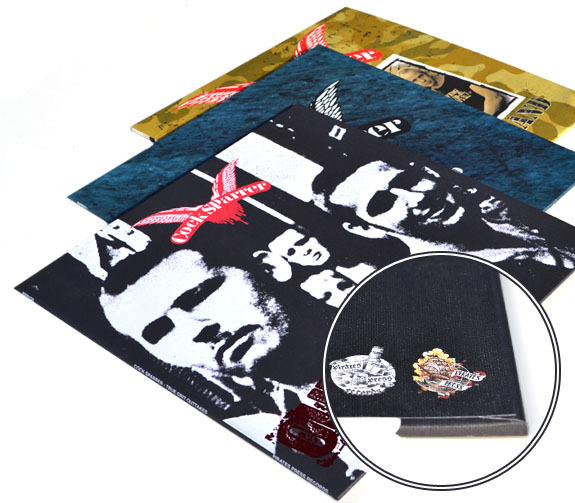 While we often use offset printed gloss, matte, or uncoated paper to wrap these, we've used leather and fabric type stocks as well – which are both printable, but really look amazing with foil stamping! Casewrapped jackets are available for all sizes, and also as gatefolds and triple gatefolds too. They cost more, but they warrant costing more in stores as well – they are the top of the line, the Aston Martins, Bentleys, Lamborghinis and Ferraris of vinyl packaging, hands down.